It's a long time I don't post anything on this forum. In these months here in Italy I have studied several aspects of RS41 decoding, from GFSK to data telemetries. So I started to develop and engineering tools on that topics. The result is a Freeware software called RS41 Tracker. Suggestions are of course welcome. RS41 Tracker is a software running on Windows that it’s able to decode telemetries generated by Vaisala RS41 radiosondes. Used in conjunction with a FM radio receiver it allows operators to display radiosonde positions on a map and to control other meaningful parameters like temperature, wind speed/direction and burst killer related information. * Directly decoding of GFSK signal received by the FM radio receiver (the use of a Software Defined Radio is recommended). * Capability to connect and command SDRSharp software by mean of Net Remote Control plugin. * Advanced frequencies scan and decode: RS41 Tracker is able to look for RS41 radiosonde signal in a given list of frequencies, starting the radiosonde decoding when a valid signal is detected. 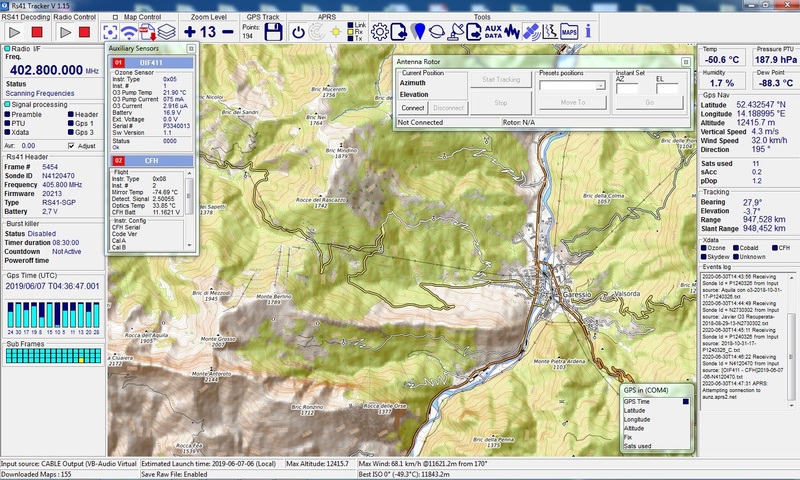 * Map type selectable by user (road, satellite, hybrid, terrain). * Burst killer detailed information and launch time estimation. Thanks for nice post and very nice software !! I tested it today and it works good ! Thank you for your feedback and for your suggestions. 005 - Tracking information added. RS41T is now able to provides elevation, bearing, range and Slant range of the received sonde. 004 - Home location is now shown on map using a new marker symbol (settings -> Maps to provide Home coordinates). 002 - The decoding function doesn't work as expected When Radio control is activated but SDRSharp plugin is not running. Solution:Radio Control Engine reengineered. Diego, this forum is closed. We moved to a new forum. Stranica je generirana za 0.136 sekundi uz 25 upita.